HOUSTON, TX, April 20, 2016 – This past week over $50 million in grant proposals benefiting the eight-county Greater Houston Region were submitted to the Texas Commission on Environmental Quality (TCEQ) to be considered for funding under the RESTORE Act, part of the gulf oil spill recovery plan. The total amount available for funding under TCEQ’s current request for RESTORE applications is $56 million (www.restorethetexascoast.org). As part of a two-year effort to create the first-ever 8-county Gulf-Houston Regional Conservation Plan (Gulf-Houston RCP), over 50 partners collaborated together to submit the 14 respective projects, ranging in amounts from $750,000 to over $12 million. These projects allow for hundreds of acres in restored prairies, riparian corridors along 14 creeks and bayous, coastal wetlands, reforestation and nature-based pedestrian trails (see attached Joint Letter of Support from the Gulf-Houston RCP Steering Committee and map of the project locations). The past week provided plenty of evidence of why these projects are critical to the Greater Houston Region. Upstream prairies and coastal wetlands significantly help prevent flooding of homes and provide hurricane storm surge protection. One acre of prairie land can absorb 9 inches of rainfall per hour before runoff occurs, and will intercept as much as 53 tons of water during a 1-inch per hour rain event. Large-scale tree planting also absorbs tons of water and significantly cleans the air and water in our region. The Gulf-Houston RCP (www.gulfhoustonrcp.org) collectively identifies our region’s most pressing environmental needs with projects organized into five (5) key initiatives. In addition to the flood control, and water/air quality benefits, the funding and implementation of projects in the Gulf-Houston Regional Conservation Plan will sustain and improve the ecological infrastructure of the Gulf-Houston region and provide the backbone for sustainable growth and economic development as Greater Houston becomes the 3rd largest City in America and the Texas Gulf Coast continues to provide major ports for the United States. 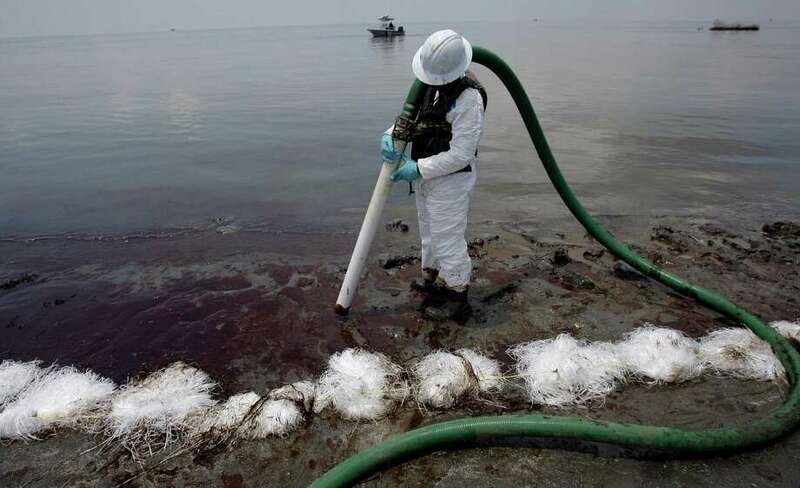 A worker uses a suction hose to remove oil washed ashore from the Deepwater Horizon spill in Belle Terre, La.